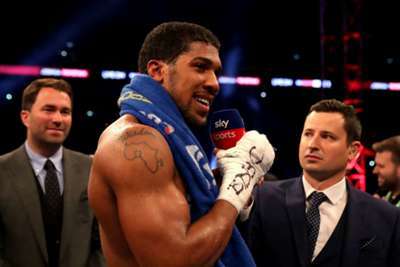 Anthony Joshua will fight both Deontay Wilder and Tyson Fury at some stage, according to promoter Eddie Hearn. Wilder and Fury fought out a dramatic and contentious draw in their WBC heavyweight title bout in Los Angeles at the start of the month. Joshua (22-0) is the WBA, IBF and WBO heavyweight champion, and it has been suggested previously the Brit will face either Wilder or Fury. Hearn said the 29-year-old wanted to eventually face both men, but his first target is Wilder. "I will be disappointed if we don't get Fury or Wilder next. The focus is Wilder, but, if we can't get him, we will go for Fury," he told The Mirror. "Those two fights will happen. "AJ wants those fights now, and so do the fans, but he has five or six years left in boxing for them to happen. "The bigger money fight is Wilder, but, for AJ, it's about legacy and becoming undisputed champion. There's more demand for Joshua-Wilder, but I don't think fans will be disappointed with Joshua-Fury." Wilder and Fury are expected to meet again in 2019, while Joshua is set to be in action at Wembley in April.